Watermelon Release ! with Cube Festival ! Get New S+ Pendant Easier ! Find in Watermelon Cube ! Get Higher Cube ! From the lower cube reward ! Get Mystic Powder x2 ! 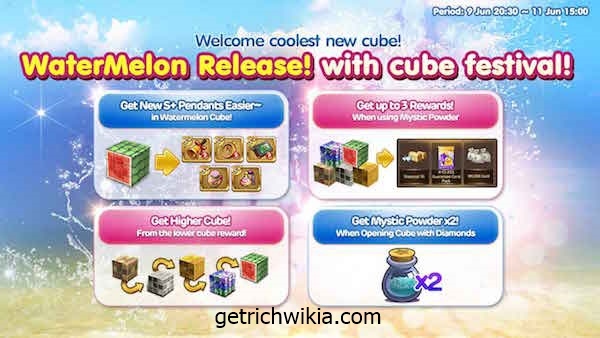 When opening Cube with Diamonds ! ระยะเวลากิจกรรม: 9 มิ.ย.20:30น. -11 มิ.ย. 15:00น.